Elie Tahari "Leona" georgette blouse. Approx. length: 20.5" down center front, 25.5" down center back. 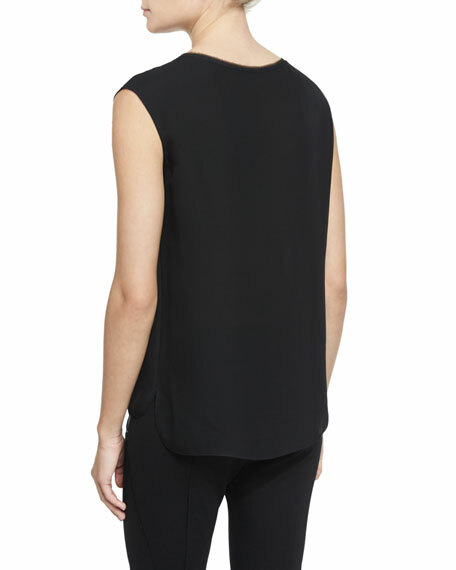 Rounded high-low hem; side slits. American designer Donna Karan introduced the DKNY collection in 1989 as a more affordable alternative to her namesake line. It's been rumored that she started DKNY after a fruitless search for jeans, and while the line does feature perfect-fit denim, it also includes a full range of looks from office-friendly day wear to after-hours party frocks. For in-store inquiries, use sku #1824518. 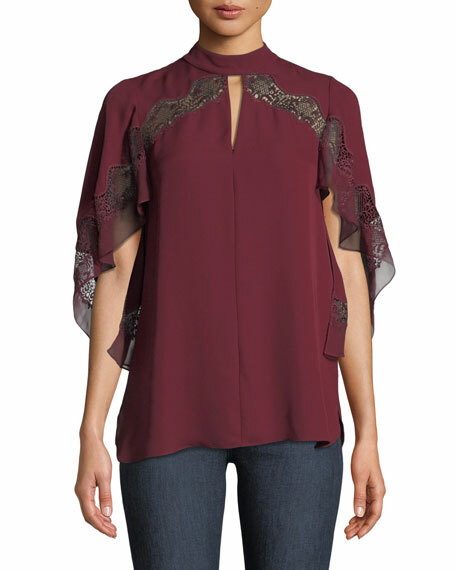 Elie Tahari "Jaylah" blouse with lace trim. Choker collar; keyhole front. Short flutter sleeves. Hook-and-eye back. Billowy silhouette. Vented sides. Silk. Dry clean. Imported. 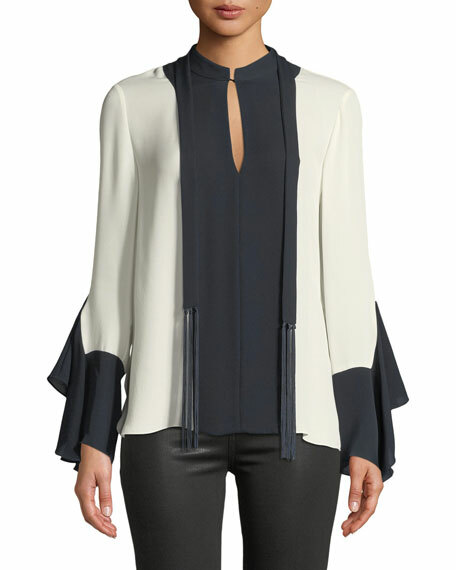 Elie Tahari "Jurnee" blouse in silk. 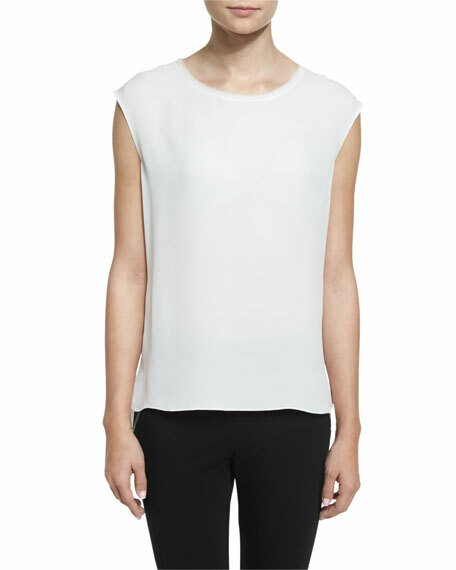 V neckline; cascading draped front. Long sleeves; adjustable button cuffs. Yoked, inverted back pleat. Loose fit. Dry clean. Imported. 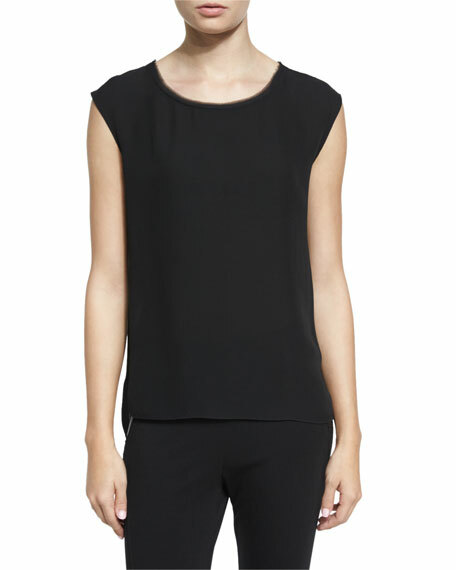 Elie Tahari "Karissa" modern dual-tone blouse. Mandarin collar; hook/keyhole V-front; fringe ties at sides. Long sleeves; contrast cuffs; cascading flounce. Yoked back; inverted pleat. Relaxed silhouette. Below-hip length. High-low hem. Pullover style. Silk; dry clean. Imported.